A black and white photograph of the conferring the Freedom of the Town of Whitby on the 34th Ontario Regiment. 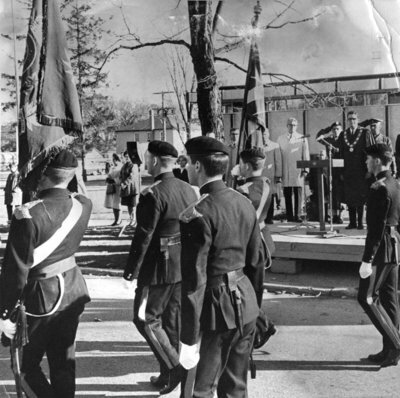 This picture shows the Regiment marching past the reviewing stand at the Whitby Municipal Building, 405 Dundas Street West. The man wearing the chain of office is Mayor Desmond G. Newman and the man in the white coat beside him is Reeve George R. Brooks. The presentation was made on the 100th anniversary of the Regiment. 34th Ontario Regiment, October 23, 1966, The Oshawa Times. Whitby Archives 29-001-036.